GLENDALE, Ariz. – A hard-working first period produced no results, and it took just 2:35 of the second period for the slumping Ottawa Senators to find themselves in a two-goal hole and in danger ending a season-opening six-game road trip with a five-game winless streak. But a few Phoenix Coyotes miscues and a whole lot of Jason Spezza changed the game, the trip and the outlook for Ottawa. Spezza wiped out the deficit with a natural hat trick and Cory Conacher put home Mark Methot’s feed 2:48 into overtime, giving the road-weary Senators a 4-3 victory Tuesday night. The Senators won for the first time since a season-opening win at Buffalo and head home 2-2-2 as they prepare to face New Jersey in their home opener at Canadian Tire Centre on Thursday. That sure beats the alternative – which looked quite possible after the Senators dominated the first period with 12 shots but came up empty, then watched Phoenix score a pair quickly. The Coyotes had one shot in the first 15 minutes and just four in the first period, but things looked good when Rob Klinkhammer scored his third goal in two games and Radim Vrbata followed with his fourth goal in two home games 2:35 into the second period. But with a chance to win four straight for the first time since April 2012, Phoenix couldn’t stop Spezza – who now has seven goals and 10 points in six career games against the Coyotes. Spezza completed his hat on the power play at 7:19 of the third period to put Ottawa ahead, but Mike Ribeiro answered by tipping home Oliver Ekman-Larsson’s power-play shot with 3:30 left in regulation for his first goal as a Coyote, sending the Senators to overtime for the fourth time in their first six games. Then it was time for Conacher, who finished off good work by Colin Greening and a crisp shot-pass from Methot to put the puck past Mike Smith and end it. 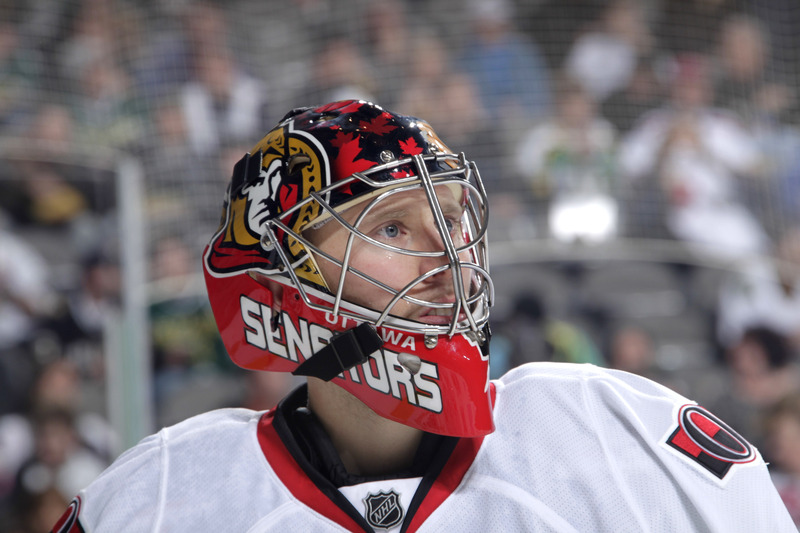 Craig Anderson, who had beaten Phoenix only twice in nine previous starts, made 34 saves for Ottawa. Smith stopped 28 shots for Phoenix and had a strong first period with 12 saves, but let a two-goal cushion slip away with some sloppy play around the net. Ottawa allowed 106 shots in weekend losses to the San Jose Sharks and Anaheim Ducks, but dominated early against a listless group of Coyotes just back from a five-game road trip themselves. Phoenix had one shot in the first 16 minutes while Ottawa had nine of their 12 first-period shots, with Smith making good saves on Kyle Turris with the glove and Erik Condra and Bobby Ryan in tight to keep the game even. But the second period was a complete reversal for Phoenix. The Coyotes reeled off a season-high 17 shots and scored on face-off wins just 1:17 apart. Antoine Vermette won a draw cleanly and put the puck on net. Anderson kicked it away — right to Klinkhammer, who hit the open corner at 1:18. Klinkhammer had a pair of goals in Sunday’s 5-3 win at Carolina and earned a promotion to the first line Tuesday. With the crowd still buzzing, Martin Hanzal pushed another draw to Mikkel Boedker, who found Vrbata for a wrist shot from the slot that beat Anderson to the top corner and the Senators appeared to be in trouble. “We took 5-10 minutes off and they got a couple of goals, but we proved we can be a really good team and you have to congratulate Spezza on those goals and we have a lot of confidence in Anderson to hold them,” Conacher said. Spezza cut the lead in half at 8:42 when Smith dived on a Patrick Wiercioch shot but lost the puck in his pads. It sat alone in the blue paint and Spezza tapped it in for his second goal of the season. Spezza was the recipient of another Phoenix miscue 1:15 into the third period. Smith misplayed a puck behind the net and then got tangled up with teammate David Schlemko on his way back to the crease. Greening collected the puck and fed Spezza in the crease, where he tied the game. When the Coyotes were penalized for too many men at 7:02, it took just 17 seconds for Spezza to pound a shot from the top of the right circle through traffic to complete the hat trick and give Ottawa its first lead. But the Senators couldn’t finish it off in regulation. Chris Phillips interfered with Phoenix’s David Moss with 4:56 left and the Coyotes cashed in. Vermette pulled a puck off the wall and fed Ekman-Larsson for a shot between the circles and into traffic. The puck deflected off Greening and then hit Ribeiro before getting past Anderson with 3:30 left to force overtime.